At the top of the list of American Eskimo names are to no surprise, names related to Alaska and Eskimos. Names like Yukon, Aniak, and Kodiak are just a few examples common among the breed. To the surprise of many, the American Eskimo actually came from Germany. Your puppy will feel right at home with a name like Fritz, Katrin, or Klaus. White is the second biggest theme for names among the breed. 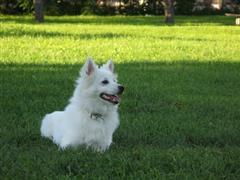 A pure white coat has brought about generations of names such as Aspen, Polar, Angel, and Blanco. If you want to venture out from the typical names, look toward the circus. The breed is known for circus performances and many fun names can be taken from the various staple acts, props, and performers. Some of our pages will contain a subcategory. A subcategory is a slightly more specific grouping than the main topic of the page. For a subcategory, we will include a separated table of names and corresponding descriptions. An example of a subcategory of Red Dog Names would be 'Dog Names Inspired by Red Wines'. If you have any subcategory ideas for the American Eskimo Dog Names page, we would love to hear them. Use the form below to submit your ideas.